What do you get when you combine a fifteen-year-old Christian Bale, an understated Charlton Heston (sans neckerchief), and a troupe of Hammer horror actors? My favorite film version of Treasure Island. I want to take the next four weeks to shine a spotlight on some movies that have two things in common: 1) I think they’re fantastic films, and 2) they are either really difficult to find -- or were until recently. 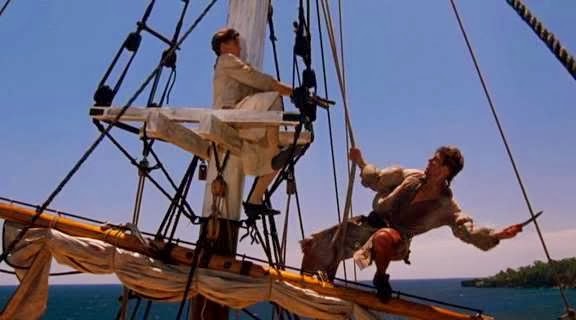 Years before Captain Jack Sparrow flew the black flag or Geena Davis helmed her own ship, Charlton Heston’s son Fraser Clarke Heston directed a realistic, well-acted and beautifully filmed version of Treasure Island, the classic pirate novel. The movie pays respect to the swashbuckling classics of the 1930s but adds a healthy dose of reality and consequence. This is no ride at Disney World. Details on the production of the film are very hard to dig up given the modest budget and collaborative financing of the project. It was a co-production of the British Lion Film Corporation and Ted Turner’s TNT Network, meaning that the film was a theatrical feature everywhere except America, where it aired on cable. Apparently Europe loves great actors telling great stories in a theater and Ted Turner loves Jane Fonda, wrestling, and cable ratings. I shouldn’t complain, though. If I hadn’t seen this on TV in 1990 then who knows how long it would have taken me to discover this awesome pirate movie. 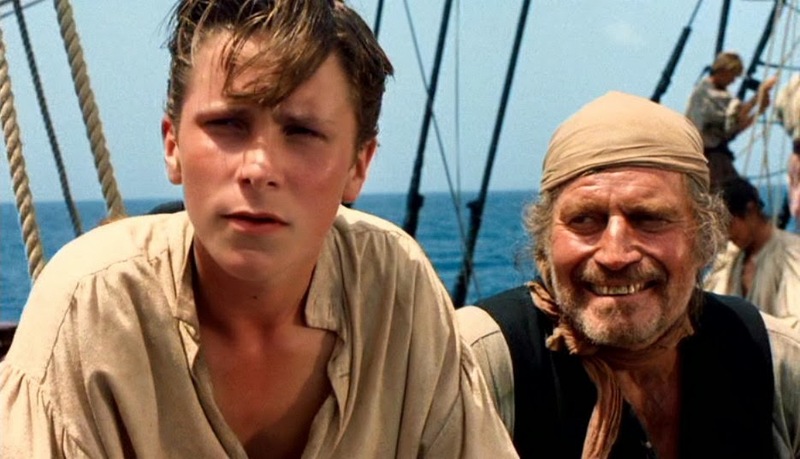 And of course, the two leads are Charlton Heston as Long John Silver and a very young Christian Bale as Jim Hawkins. According to Wikipedia, at least one critic thought Heston was miscast and turned in a really bad performance, but that’s not how I see it at all. He’s really low-key and subdued, choosing to play the pirate Silver as cunning and thoughtful. It’s a bit of a departure for him, and there’s no scene of him running through the ship on his peg leg yelling to the crew that “rum is people! You’re drinking people!” Which is too bad, come to think of it. No, a bigger performance would be out of place in this movie. I like this movie because it doesn’t feel like a big Hollywood production and feels smaller and more intimate. Some scenery does get chewed, but thankfully it’s not Heston doing the honors. No, that gets left to thespians; the English know how to do this sort of thing, including going bigger for the back row even when they’re on a film set and not a stage. 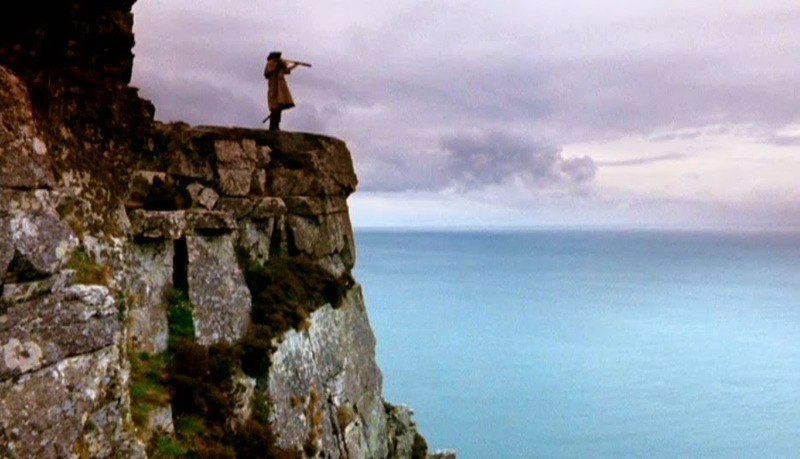 The early scenes of Treasure Island take place in the seaside village of Black Cove and the Admiral Benbow Inn, where a grizzled pirate wanders in from the sea looking for protection, and could just as easily have been part of a stage play, had the backdrops been theatrical props and not crashing waves upon steep cliff walls. There’s an air of class and confidence associated with the performances in this movie, even when it gets big. Christian Bale does a great job in his fourth feature film performance. In fact, I wish we could get a little bit of young Christian Bale back, though he still seems to be taking himself very seriously here. That’s probably for the best, considering the decades of combined experience of pretty much every single actor he shares a scene with. I have to imagine this fifteen year old kid couldn’t believe he was filming in Jamaica surrounded by established actors decades his senior. The music is also INCREDIBLE. The score is by Paddy Moloney, the head honcho of the Irish acoustic group The Chieftains, and it is seriously haunting. Mourning pennywhistle and weeping violin (fiddle?) transport the viewer to the high seas off the western coastline of England and the blue waters of Jamaica. Though no official soundtrack was ever produced, many of the songs ended up on a Chieftains album in the ‘90s which compiled various songs used in films. 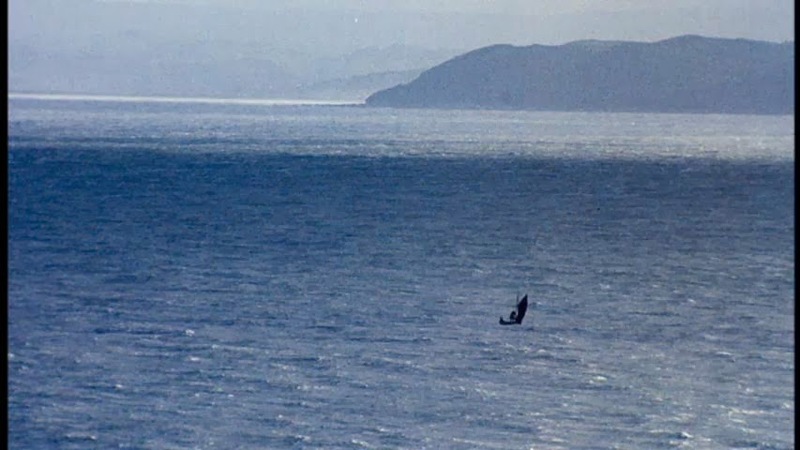 Listening to it, even without the images, instantly transports you to the lonesome sea with no sign of land on the horizon and a black flag bearing down without mercy. If you’ve never read the novel, it’s the ultimate, prototypical pirate adventure about a boy leaving the familiarity of home and embarking on an adventure of a lifetime. A few good men race against pirates to survive the sea and uncover buried treasure. Every cinematic cliché that we now associate with pirates in the twenty-first century likely stems from Treasure Island. This film version is very faithful to the novel. If for no other reason, I love this movie for how it sticks close to the source material and usually only deviates for cinematic purposes. I wish all movies based on other properties could remember what makes these stories so great to begin with. This story has been told and retold on film over the years, but this one is special. I can’t quite put my finger on it, but I think it’s the element of danger that really sets it aside. The Disney film version is relatively tame; all ages can watch it without getting too worried. But this version is dark and at times surprisingly violent. Throats are slit, people are shot at close range, and bodies are trampled by horses and impaled with swords. How this ended up on television in 1990 is beyond me. I guess allowances were made because it was cable. Now here’s where the “Obscure Greatness” title comes into play. Treasure Island was released on VHS in America shortly after it aired on television, but as far as I’ve been able to uncover, it only was only manufactured one time. Most major studio releases were constantly being re-printed (re-pressed?) as supplies ran low, and remained available all throughout the home video years. This was not the case with Treasure Island, which was only made available the one time. I was lucky to have the VHS because Avon, of all companies, was offering it in their catalog for a few months and my mom bought it for me because she knew how much I loved it. For years and years I loved Treasure Island and would ask other people if they had seen it, but they never had. Seeing a copy of the VHS at a video rental store was almost unheard of. Outside of America, the video was retitled Devil’s Treasure for some unholy reason, which certainly didn’t help. I worked a video counter for a couple of years during the ‘90s and I don’t remember that store having it, either. There was reportedly a laserdisc pressing floating around as well, though I never saw it and my worn video tape became more and more precious to me as it aged. The movie, because of its obscurity, began to take on a mythical status with me, which is always a dangerous thing. It began to pop up in bootleg circles. Used copies of the VHS were selling for ridiculous sums of money from third party sellers. Things weren’t looking good for this movie’s legacy. Luckily this story, unlike some of the others I will be writing about in the next few weeks, has a happy ending. Treasure Island was finally issued on a full frame DVD in September of 2011 by Turner Home Entertainment. I’d love to have this on widescreen anamorphic Blu-ray, given that it was shot on film and theatrically released in many markets, but beggars can’t be choosers. 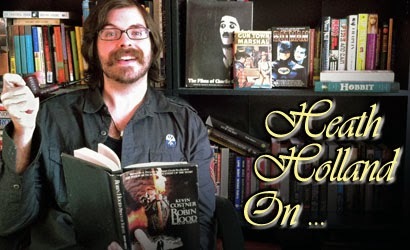 The good news is that the movie is back in print and available online for a very small price. It’s too bad that the distribution model for Treasure Island, which saw the involvement of a lot of talented people in several countries, was so quickly buried by its creators, effectively robbing this great film of any sort of a legacy. At best it’s a cult classic, but that’s being optimistic. The truth is that few people have ever seen it and fewer are aware of it. I’m writing this column in hopes of changing that and doing my part to send this ship that’s been lost at sea for two decades into port where it can be appreciated once again. If not loved, it at least deserves to be seen. Love this piece. I've never seen this one, but I love the story (enough that I even sat through the bloated Eddie Izzard version a year or two ago) and I'm looking forward to tracking this version down. Thanks for letting us know it's out there! I confess that I haven't seen the Eddie Izzard version. I've seen it in stores, but wasn't it a sy-fy channel miniseries or something? My rule is that if you can read the book in less time than watching the film version, something's wrong. Heath you had me at, Christopher Lee, Oliver Reed and Pete Postlethwaite. (Best villain ever in the "Sharpe" series) I will definitely be checking this one out. Yes Heath! I taped this off of TV when it came out, and watched it all the time. I was 7 at the time and it was one of the first non-cartoon movies I had ever seen (besides Star Wars). I haven't seen it since, but a few things really stuck with me ever since, mainly the graphic violence. I echo your sentiments, this is a largely forgotten movie that deserves to be seen. You have certainly piqued my interest in it all over again. Great column! Woo hoo! If you tell two friend, and THEY tell two friends, and THEY tell two friends, then our Treasure Island cult will be off and running. Also, I've just decided I think I want to call this movie "Heston Island." Heath, nice pick. I was finally able to watch this last night and I really enjoyed it. Like you said, great performances by great actors. Probably the best treatment of the book I have seen yet. "Rum is people!" had me laughing for a good 5 minutes, thanks ^^. This is the best pirate movie ever made, IMO. Spot on Heath. Oh how I wish this would be re-issued. I taped the original airing and get it out occasionally. A seriously under rated piece. So how can one see this version ? By the way, is that a Savinelli pipe ? My mom taped this off of tv for some reason and all my siblings and I loved it (plus Christian Bale was gorgeous to my 10 yr old self). My brother bought a pirated version and then let me know when the DVD came out. Just watched it with my kids tonight. Still just as good!